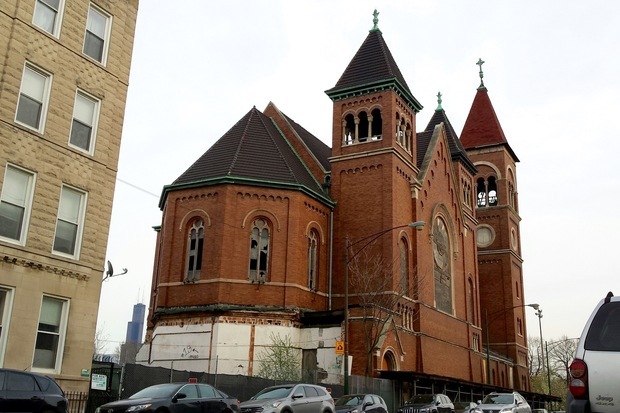 NOBLE SQUARE — With nary a minute to spare, St. Boniface Church in Noble Square was saved from demolition on Friday, thanks to a developer who finalized his acquisition of the century-old building and plans to add 39 residences and a music school on the northeast corner of Noble and Chestnut street. "We closed! [on the sale]. Thanks to the support and dedication of the community, the city, and the team, the St. Boniface adaptive reuse project is now a reality," developer Michael Skoulsky said on Friday. The price that Skoulsky paid for the church was not immediately available. Last month, Skoulsky was given a city-ordered deadline of Friday to buy the church, which was also targeted by another developer who planned to demolish it and construct single-family homes. Earlier this year, city officials told the church's owner, Phil Moeller, that he must either repair the dilapidated church or demolish it. 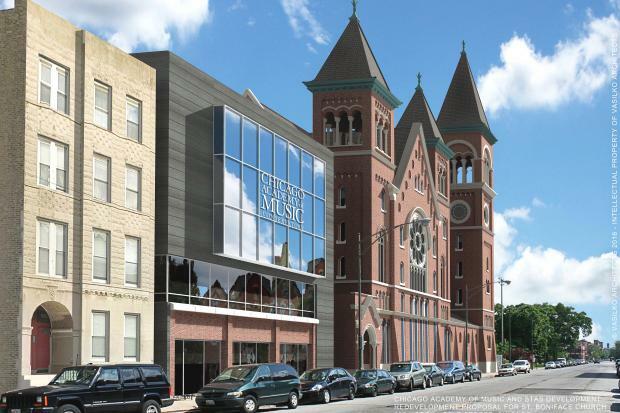 In the months since then, Preservation Chicago director Ward Miller worked to cobble together a plan for the Hyde Park-based Chicago Academy of Music to add a satellite campus in the church, a portion of which would also be re-purposed for housing. Miller, with the help of Bob Zwolinski, an East Village resident, approached Skoulsky, the president of Stas Development, to see if he was interested in overseeing the project. Living three blocks away, Skoulsky was eager to get involved. "I've been walking my dog past [the church] every day now for three years, just wishing I could get my hands on it and refurbish it," Skoulsky previously said. Now that the property has been bought by Skoulsky, it will be saved from demolition, city officials said. Eleanor Esser Gorski, deputy commissioner of the Planning, Design and Historic Preservation Division of the city's Department of Planning and Development, sent an email late Friday to neighbors of the church whom she addressed as "Friends of St. Boniface." "The Department of Planning and Development is pleased to inform you that the St. Boniface property was purchased today by STAS Development, which intends to reuse the structure as part of a new housing development and music school," Gorski announced. She told residents that Stas Development now has control of the property and will be responsible for its maintenance and security until rehabilitation begins. Plans are expected to be submitted this fall and will undergo zoning review and to-be-scheduled public hearings. "Congratulations on your tireless advocacy to preserve the property and your instrumental role in making it happen!" Gorski told residents. Skoulsky's plans include rehabilitating the church into 15 residential dwellings. The proposal also includes a new 24-unit residential building next door and a Chicago Academy of Music school. Miller said that the saving of St. Boniface is especially important to the nonprofit preservation group's history and mission. "We founded our organization on the steps of St. Boniface in 1999. St. Boniface is where we all met. We felt like there needed to be more advocacy to save this building," Miller said. 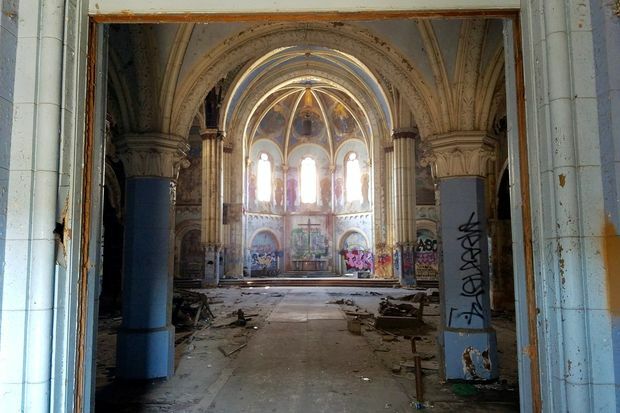 Miller added, "We are grateful to the City of Chicago, the Archdiocese, the community, the East Village Association and Neighbors of St. Boniface. I know in my heart of hearts that the building is still standing as a result of all of our effforts." 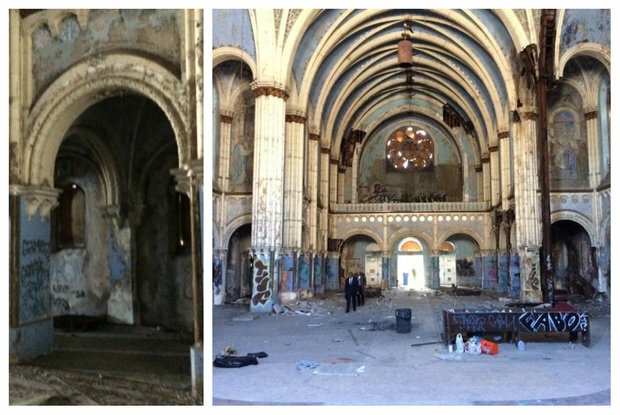 Designed by architect Henry Schlacks, the 32,000-square-foot Romanesque-style church was completed in 1902. It closed in 1990. In a Facebook update, Zwolinski said, "To see a community come together with one objective in mind is simply beautiful. Tonight we, Noble Square, prevail." The back of St. Boniface Church.